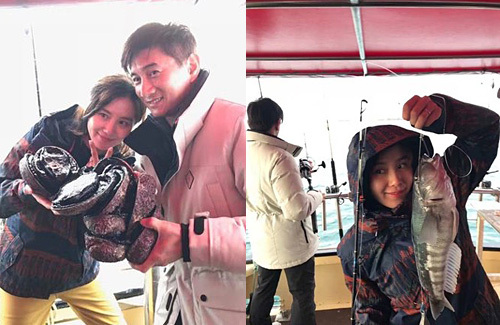 Despite the 17-year age gap between couple Nicky Wu (吳奇隆) and Cecilia Liu (劉詩詩), they have been married happily for three years. Earlier, the couple was spotted in Japan and New Zealand on vacation. Having met on set of Mainland China’s hit series, Scarlet Heart <步步驚心>, the two began a relationship shortly afterwards and eventually tied the knot in 2015. Although they’re regarded as one of Mainland’s golden couples, the two maintain a fairly low-key private life, only opting to share with fans their most special moments. Taking some time off to celebrate their third year of marriage, Nicky and Cecilia first headed to Tokyo for a couple of days before flying to New Zealand where they shared photos from their fishing adventure. Happy with their catches that day, Cecilia was seen holding up a large fish, dressed in her windbreaker jacket and completely makeup free. The photos went viral on Weibo, with the picture of Cecilia’s makeup free face becoming an instant Internet sensation. Despite the wet and fall weather in New Zealand, fans saw that Cecilia’s bare complexion was rosy and her skin was in excellent condition. Many fans praised the actress for her natural beauty and exclaimed that she looks exactly the same with or without makeup products. Sweet couple. Hard to tell that there is a 17-year difference between them! And LSS has always had a rather beautiful, radiant complexion. With her declining popularity, she probably decided that she’d rather focus on her family life and spend more quality time with her husband. Sometimes, celebrities can get so caught up in the fame and glory that they neglect to foster their personal relationships. I agree. It looks like LSS is now focusing more on her family and spending quality time with her husband. After all they both have been working hard all these years. I don’t think it’s hurting her popularity that much. It seems like she is doing more of products’ endorsements these days – especially this past year. I’m still waiting for her new drama “If we could love like this” with Tong Da Wei to be released. I hope they will air it soon. I hope they will have a child soon. Best wishes to both of them.